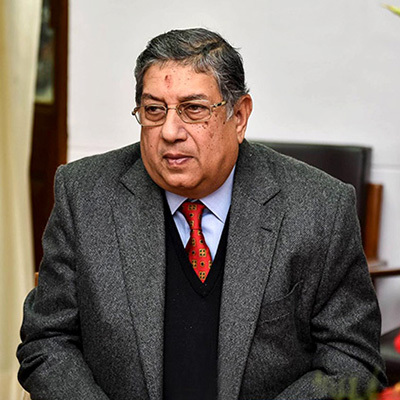 Mr N Srinivasan, Vice Chairman & Managing Director, The India Cements Ltd is a BSc (Tech) from Madras University and Post Graduate in Chemical Engineering from Illinois Institute of Technology, U.S.A. Mr. N.Srinivasan was associated with the Company from 1968 to 1978 and from 1989 till date. Mr Srinivasan is a special invitee to the General Committee of The Madras Chamber of Commerce and Industry. He is now member of the reconstituted Development Council for Cement Industry. He is presently the president of Tamil Nadu Golf Federation and Tamil Nadu Cricket Association. A Lifetime Achievement Award was conferred on Mr Srinivasan by TIECON in the year 2009 and also a Degree of Doctor of Literature (Honoris Causa) was conferred on him by the Tamil Nadu Physical Education & Sports University, Chennai, in the year 2011. In the past, Mr Srinivasan was closely associated with various industrial bodies. He was the President of the Cement Manufacturers’ Association for five terms during the periods 1991 to 1994 and 2004 to 2006 and Chairman of the Board of Governors of the National Council for Cement and Building Materials (NCCBM) for four terms during the periods 1991 to 1993 and 2004 to 2006. He was also the Chairman of Development Council for Cement Industry (DCCI) constituted by the Government of India for two terms during the period 1992 to 1996. He was a Senior Vice President of Federation of Indian Chambers of Commerce and Industry (FICCI). He was President of Madras Chamber of Commerce &Industry (MCCI) for two terms ( 1996-1998) and President of All India Organisation of Employers ( AIOE) during 2000-2001. Mr Srinivasan was the Sheriff of Madras for two terms during 1989 and 1991. He was an active member of the Prime Minister s ( A B Vajpayee) High Profile Council of Trade and Industry ( 1996-2001). Mr Srinivasan was also closely associated with leading sports bodies in the country. He was the President of Board of Control for Cricket in India ( BCCI) and Chairman of International Cricket Council ( ICC). In 2002, he was elected as President of Tamil Nadu Cricket Council (TNCA) and since then he was getting elected consecutively for a number of years.